Without it, the Poland is not a Poland. The crest should be high, large, full and circular. In the female it is referred to as ‘globular’ and will be smooth. In the male, the shinier, thinner, characteristically male feathers, make the crest fall over the shoulders almost like a wig. In both sexes it should be high in the front and extend down the nape of the neck. The crest should be wide and at no point narrow or lacking in substance, there should be no parting in it. On the other hand the crest should not be so heavy as to obscure the eyes or pull the skin down, causing folds over the eyelid. Needless to say, with this single feature attracting nearly a third of the points, it is vital to get it right. Cuckoo Poland Crest with undesirable white in the crest. The head should be topped by the bony knob from where the crest emerges. The way the crest sits is important for the overall shape of the head, and a poor crest will also reduce the points here. The beak should be topped with the wide nostrils and the eyes are full and dark. The comb, if present is of the horn type and small. Muffling is absent, with large long wattles (although not so long that they throw the head out of proportion). As for the white crested, except muffling is present and wattles are absent. The muffling should be full, and almost hide the face. Another important feature and responsible for another third of the overall points. Colours should be solid and with no paling or other colours present. Black birds should have a ‘beetle green’ sheen. The laced varieties should be clearly laced or spangled depending on the feather type. The silver laced may have white feathers in the crest of older birds. In the white crested birds, the crest should be a snowy white with no coloured feathers except for the coloured band at the front, which should be the same colour as the body. In cuckoo birds, there should be no solid colour feathers. Buff base colour with white edging, the crest will be white at the base and tips – a pale, washed out crest is not desirable. There should be no self white feathers. The feathers should be distinctly laced , splashed or tipped depending on their position on the body. As the chamois, except the lacing is black and the base a golden bay. As the chamois, except the lacing is black and the base silver. The self white, black and blue are a solid colour throughout. Chamois and Gold Laced Frizzle Polands. Surprisingly, this is the lowest of the points, but nevertheless, without type, your bird will be rejected. It should look long and sturdy. The wings should be large and tight to the body. The tail should be full, neatly spread and not upright – it is held at a lower angle than normal. Remember too that the bird should be alert and lively; a sick or lethargic bird will be disqualified. Legs should be slate or blue, with 4 toes on each foot. Large birds should weigh 2.95 kilo (6½lb) for males and 2.25 kilos (5lb) for females. 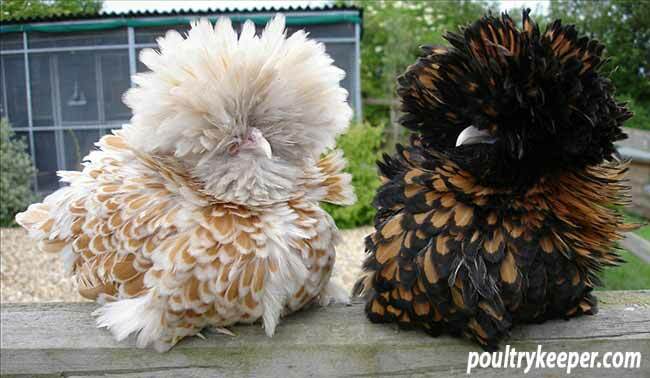 In the bantam size, males should be 680-79g (24-28oz), females 510-680g (18-24oz). As this is a breed with a number of inherent problems, condition is very important to ensure healthy birds without genetic problems. Judges will be looking for health, freedom from parasites and absence of genetic faults and skin conditions such as infested eyes caused by a heavy crest. Birds that are over-shown may develop stress symptoms such as ‘cage fatigue’ and become lethargic. 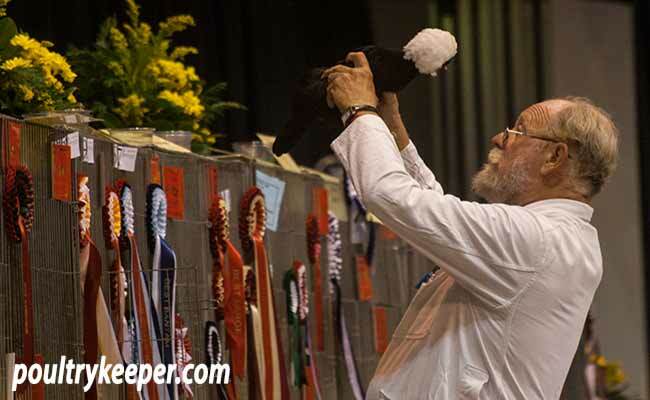 Your bird should have been washed and cleaned in advance of the show to present it at its best. For further information, see the British Poultry Standards in association with the Poultry Club of Great Britain. Cover D cups with tape to limit access to water – this prevents crest soiling. Give water yourself, do not reply on show stewards who do not know the breed. A few stubs of feathers on the legs can be removed with tweezers, but if there are too many you can end up with holes in the shanks which will point to doctoring your bird. Similarly, a few miscoloured feathers can be removed, although too many and a good judge will be able to tell. Heavy crests can cause eye damage when the weight of the crest pulls the skin over the eye, so try to eliminate this from your breeding stock. Always check for eye infections. Laurence has previously judged at National level and has sat on several international breed club committees. He is the author of the Haynes Chicken Manual as well as contributing to several poultry magazines.